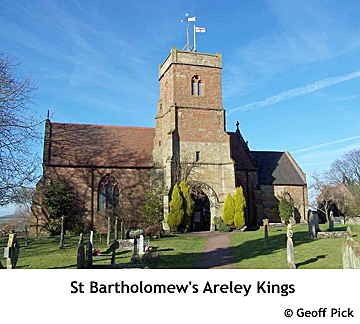 ARELY-KING'S, or LOWER ARELY, a parish in the upper division of the hundred of DODDINGTREE, county of WORCESTER, ¾ of a mile (S. W. by W.) from Stourport, containing 358 inhabitants. The living is a rectory, in the archdeaconry and diocese of Worcester, rated in the king's books at £9, and in the patronage of the Rector of Hartley. The church, which is situated on an eminence, whence there is a remarkably fine and extensive prospect, is dedicated to St. Bartholomew. In the burial-ground is a rude sepulchral monument, composed of oblong square stones, piled on each other, and bearing a quaint rhyming distich, importing that a person named Sir Harry lies interred beneath it. Who Sir Harry was, has not been satisfactorily ascertained; but an affecting story is related of an individual who was driven into seclusion here, from the loss of an only female child, that was drowned by falling from his arms, as he held her at a window, into a moat beneath, and who is supposed to have been interred here. At Redstone Ferry, on the river Severn, which forms a boundary of this parish, is a very high rock, in the side of which was excavated a hermitage, consisting of a chapel with an altar and some apartments: over the altar was painted a figure of an arch-bishop saying mass; in 1736, several human bodies, supposed to have been those of the hermits, were discovered. Layamon, author of a poetical Chronicle of British History, from Brute to Cadwallader, who states himself to have been a priest residing at Erenlege on the Severn, and who lived in the latter part of the twelfth century, is said to have been born here.